Posted by Onely in Bad Onely Activities, Great Onely Activities, Secret Lives of the Happily Single. Welcome to the latest installment in our SLOTHS series, where we explore the Secret Lives of the Happily Single and celebrate their enlightened idiosynchrasies! Lisa and I write a lot about the specific instances in our daily lives when we are grateful to be single. Often a banal moment such as not having to rinse out the laundry detergent lid will trigger a flood of endorphins. I get almost weepy with happiness at night when it’s time to go upstairs to my cozy peach-and-blue bedroom for my nighttime wind-down. I love sitting on my full bed and futzing around with my novel, or tearing articles out of New Scientist, or doing forward bends, without someone scurrying around in my periphery. But what if I were a single parent? I’d have a small scurrier around all the time. Lots of the things I like about being single now–having my quiet time, eating whenever and whatever I want, sleeping from 2 am to 11 am on Saturdays, watching Corey Feldman dance on YouTube–are impossible or irresponsible if you have kids. Yet I’m sure that there are Onely parents out there, and they must have their own beloved SLOTHSy habits that they would miss if they ever coupled up. I’ve been trying to think which of my SLOTHSy proclivities I would be able to keep if I had kids. I suppose it depends on their age, whether they’re in school, how many hours I have to work, and so forth. But no matter what, I’d still have to do laundry, and I’d still rejoice at not having to rinse out the detergent bottle cap. I’d also like not having someone else to tell me how to raise my child (“Are you crazy? Don’t let them watch that Corey Feldman video!”). Copious Readers, if you are a single parent, we want to hear from you what you like about being single and a parent. And if you have things you don’t like about being single and a parent, we want to hear those, too. P.S. 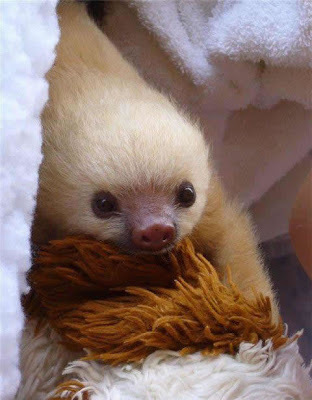 How adorable is this baby sloth picture I found? Check out Kirsten Hubbard’s Wandergirl blog, where every week she posts a picture of a baby animal! Not a single parent myself, but it’s good that you brought up this topic. Too many times, I’ve heard people bring up the absence of children as either a positive or negative aspect of single life. You think they’d never heard of single parents. Singlehood exists independently of children. christina – I’m a single mom, too. I was just telling someone yesterday that I cherish the time after the girls go to bed and I can be free to be alone, and sometimes I don’t know how married women do it, having to deal with their husbands after their kids are asleep! I cherish, crave, and need that alone-time. So every night I’m grateful for my single status.